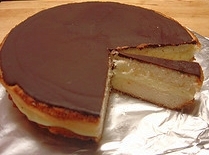 Easy to make, you will keep this Boston cream pie recipe under lock and key - because it is amazing. I don't know why they call it a "pie" because it is actually a wonderful decadent cream cake. This homemade cake recipe will be requested often. PREHEAT oven to 375 degrees. Grease and flour two 9 inch cake pans. Mix first five ingredients together and mix well. Place into prepared cake pans and bake for 25 minutes. Cool and slice crosswise (horizontal) through the center of the cakes. Place custard between slices. Top with chocolate glaze and whipped cream. Yum. Bring milk to boiling point. Meanwhile, break eggs into bowl and add sugar that was mixed together with the flour. Stir mixture into hot milk as it begins to boil. Add butter and whisk until thickened. Remove from heat and fold in vanilla. Cool. In a double boiler over simmering water, combine chocolate chips, butter and corn syrup. Stir until chips are melted and mixture is smooth, then add vanilla. Spread warm glaze over top of cake, letting it drizzle down the sides.